Soak up the colour and excitement of one of the world’s most exciting cities – the former Imperial capital of the Byzantine and Ottoman empires – and step back in time as you wander through some of its finest classical sites. Make the most of an opportunity to visit the remarkable natural phenomenon of Pamukkale on an optional tour, and enjoy the sun-kissed warmth and welcome of Aegean shores as you spend three nights in Kusadasi. Flights also available from other UK airports – Birmingham, London Gatwick, London Heathrow & Manchester – click here for more information on available dates and prices. 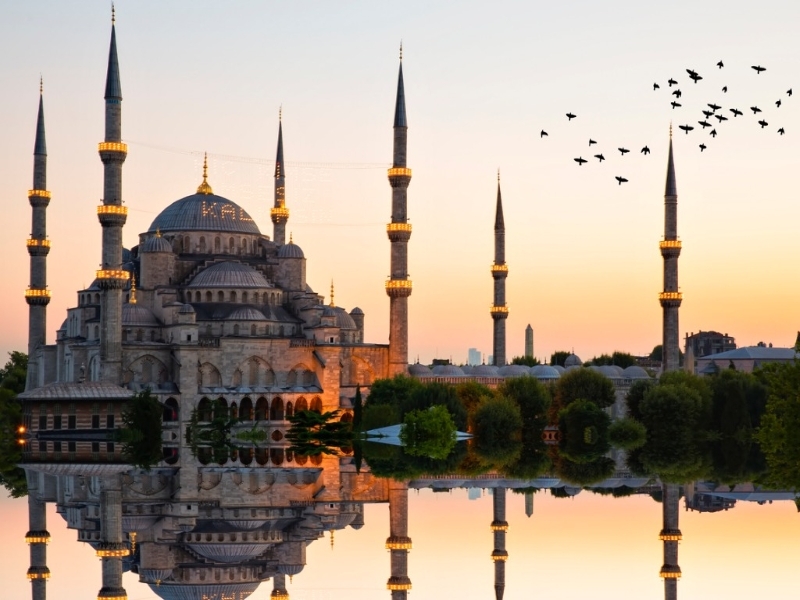 Fly to Istanbul, meet your tour manager and transfer to the hotel for a three-night stay. Dependent upon your time of arrival, acquaint yourself with your surroundings. Enjoy your first evening in an extraordinary city that bridges the divide between Europe and Asia, marked by the narrow strait of the Bosphorus, which brims with reminders of its illustrious past. Enjoy today’s first fascinating included tour, introducing the city that was once Byzantium, then Constantinople. Explore the Historic Peninsula, including the extraordinary Topkapi Palace, with its priceless treasures, the Blue Mosque with its minarets and cobalt tiles, and the great Byzantine church of Aya Sofya, once the world’s largest enclosed space. Your tour includes entrance to the Topkapi, with its outer courtyard and gateways into its labyrinthine inner quarters. You’ll also take in the colourful spice market, with its trays of Turkish delight. Another unforgettable day sees you return to the Historic Peninsula to explore the contrasting wonders of the remarkable Blue Mosque and the monumental Aya Sofya church. Your day will include a guided stroll through the ancient Roman Hippodrome and a visit to the world’s largest covered bazaar, the vast Kapali Carsi. The rest of the afternoon is free. Why not take an optional cruise along the Bosphorus River? Spend your last evening in this fascinating, glorious city, perhaps dining al fresco. Leaving Istanbul this morning, you’ll travel by coach around the Sea of Marmara, then inland and south onto the stunningly beautiful, Gallipoli Peninsula. Known for its darkest hour in 1915, this is where the Allied forces suffered catastrophic losses, including some 10,000 members of the Australian and New Zealand Army Corps – the famous ANZACs – at the hands of the defenders of the Ottoman Empire. The beauty of ANZAC Cove and its surroundings is in marked contrast to the sobering memorials and cemeteries. Later this afternoon, you’ll cross the narrow strait of the Dardanelles to sea-front Canakkale. Enjoy a first day amongst the wonders of classical Greece, as you explore the nearby ruins of Troy, guarded by a replica giant wooden horse recalling the tale of the first Trojan War. You’ll also visit the ruins of Pergamon, including an acropolis, temples, two-storey Library, Altar of Zeus and a spectacular, 10,000-seater theatre. Spend today at leisure, enjoying the many facilities of the resort, strolling along the harbour promenade, discovering the medieval Kale district, or visiting tiny Pigeon Island. Alternatively, join the optional excursion to the geological wonder of Pamukkale, where white calcium deposits, some 100 metres high, shape a slow moving, ever-changing cascade, with hundreds of terraces and pools filled by an ancient mineral-laden spring. Ruins of a once great city surround the thermal baths, including a Temple of Apollo and restored Roman theatre. En route to Pammukale, you’ll stop at the ‘red water’ springs of Karahayit, famed for their curative powers. The final included excursion takes in ruined Ephesus, one of the most important Roman, then Byzantine, cities, and of course witness, in the 1st Century AD, to the preaching of the Apostle Paul. The ruins – which include churches, bath-houses, fountains and temples, gymnasia, the great Roman Amphitheatre, the facade of the fabled Library of Celsus and the colonnade of the Arcadian Way – serve to reflect this greatness in breath-taking fashion. You’ll return to Kusadasi this evening to enjoy a last dinner at the hotel. Today you’ll journey to the airport to begin your return journey home.